Unlike Calvin here, I don’t want the complicated nature of ethical questions to discourage your intellectual inquiry. In this class, the goal is not to solve these issues, but to explore them. Thus, when you write your responses and essays, I am interested in the depth and originality of your exploration of these ideas and not in your judgement or solution. Feel free to criticize these ideas and propose your own. Now that we have a solid base on which to begin our exploration, let’s begin with our first weekly unit. One of the most common story tropes in Science Fiction is the idea of the “utopia.” The word was first coined in Sir Thomas More’s 1516 book Utopia, in which he set out to describe what a perfect society would look like. Defined simply, a utopia is “an imaginary place in which the government, laws, and social conditions are perfect” (Miriam Webster). Utopias are usually depicted in order to make a commentary on what values and beliefs a society should adopt. An author uses a utopia to show that if society adopted their beliefs about laws, religion, economics, human rights, or other important social issues, that what would result would be a peaceful and perfect society. Thus, a utopia is always a comment on ethics. Utopias illustrate what the author believes to be perfect ethical conduct. Yet, is a perfect society even possible? More himself may not have believe so. When he coined the term “utopia,” he constructed it with a double meaning. “Utopia” is constructed from Greek roots for “no place” and “good place”: “utopia” is a compound of the syllable ou-, meaning “no”, and topos, meaning place. But the homophonic prefix eu-, meaning “good,” also resonates in the word, with the implication that the perfectly “good place” is really “no place (utopia). Therefore, a utopia is both the perfect place and no place, meaning that such perfection is impossible. Utopias may be impossible to achieve, but their more sinister brother, the dystopia is all too real. A dystopia is “an imagined place or state in which everything is unpleasant or bad, typically a totalitarian or environmentally degraded one” (Oxford). In short, a dystopia is the opposite of a utopia; a place in which everything is in the worst possible condition. Often, a Science Fiction writer will depict a dystopia as a kind of warning to the present day. For example, a dystopia in which everyone has to wear oxygen masks in order to go outside may be a warning to our present day to decrease pollution or potentially face living in a nightmare world. 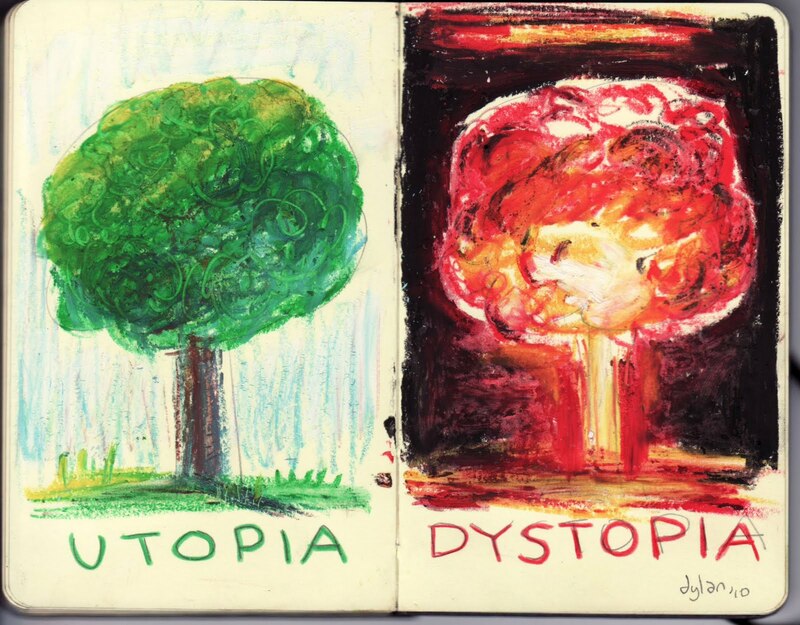 While they are opposites, utopias and dystopias can come from the same intent. One man’s utopia is another man’s dystopia, and it is often the case that dystopias can be the result of the failed construction of a utopia. For example, dictatorships are frequently the result of a man who took full power to reshape society into what he considered to be an ideal. In the process of making it a perfect place for him to live, he has made it a hell for others. As you read the next three stories, I want you to consider how each of the societies depicted fit the definitions of utopias and dystopias. Think about what each author might be criticizing about society and human nature through their invented utopia/dystopia. 1. How does conformity blind ourselves to the ethics of our decisions? 2. How do we use tradition was a way to keep from questioning the ethics of our actions? Shirley Jackson (1916-1965) was one of the most popular writers of horror stories and mysteries in the 50s and 60s. He short story, “The Lottery,” was by far her most infamous work of fiction and it has become one of the most widely read and taught American short stories around the world. “The Lottery” was originally published in 1948 in The New Yorker and it immediately caused controversy. Jackson and the magazine received hundreds of angry letters from people outraged over the depiction of cruelty and senseless violence in the story. People canceled their subscriptions to the popular magazine and the story was even banned in South Africa. I want you to think about what it is that makes “The Lottery” so controversial. Let’s consider a few themes the story engages. Why do all of the villagers participate in the lottery and the stoning? They all conform to this one rule, but why? What’s forcing them to conform? Think about this in your own lives. Why do we conform to the rules of others, even when we know they are wrong? This story was published in 1948. America had just defeated the Axis powers in World War II thanks to an unprecedented, nationwide act of working together. Everyone had sacrificed for the cause. Thus, America was willing to conform to rules that limited our freedom, with the hope that it kept order and stability in the nation. We had just defeated the Nazis, a political party that demanded conformity to rules at all costs. Nazi ideology was also heavily based on persecution. The Holocaust, for example, showed everyone how a group of people could be forced by the ideology of conformity to be complicit in a horrific, barbaric act. When people conform, they often fight against anything they perceive as a threat to their group, including any kind of outsiders. The Nazis persecuted the Jews during World War II in part as a way to consolidate power over the German population and to provide a scapegoat to blame all their problems on. Notice how arbitrary the persecution in the Lottery is. Tessie goes from ordinary young woman to enemy simply by drawing the wrong card out of the box. Early in the text, she is somewhat set up to be a little different. She shows up late and repeats that the process if unfair. She is now seen as a threat to a system that keeps order and when her card is selected, the villagers have no problem in killing her. Remember that segregation and the Jim Crow laws were still in effect when Jackson wrote this. MLK Jr. was still a college student. We had just forcibly sent Japanese-American citizens to camps during World War II. Persecution’s ugly face was alive in our country, and perhaps some people who were comfortable with it saw a criticism in Jackson’s story. We all love traditions. Thanksgiving is awesome, for example. But have you noticed how sometimes traditions have gotten a bit off track from their purpose? Thanksgiving was supposed to be about being thankful for having enough food to survive. Now, it is about getting ready for Black Friday shopping where we bash someone over the head at Wal-Mart for a 50 dollar discount on a flat screen TV. Traditions can lose their meaning and people can forget the point of tradition. Yet, we still go on with it, afraid of change. How does the power of tradition affect the story in “The Lottery”? Is there still a point to this tradition? Why or why not? Why are the older people threatened by the fact that other villages have given up on the lottery? What might Shirley Jackson be criticizing about tradition in this story? 1. Does the happiness of the majority outweigh the suffering of the minority? 2. Does walking away from a problem absolve us of responsibility for that problem? 3. Are we morally responsible for our actions if we are just following orders? “the task of science fiction is not to predict the future. Rather, it contemplates possible futures. Writers may find the future appealing precisely because it can’t be known, a black box where “anything at all can be said to happen without fear of contradiction from a native. The future is a safe, sterile laboratory for trying out ideas in, a means of thinking about reality, a method” (Le Guin). Here, she identifies our unhappiness and our skepticism as barriers to our happiness. We are so used to the sinister and the deceptive that we are constantly looking for it and assuming happiness has an ugly interior that it masks. Omelas is pure happiness, perhaps out of the reach of us cynics and skeptics. Yet, even before she includes the twist that tips utopia to dystopia, she gives us a hint in this very passage. Note the term “banality of evil.” This is a specific philosophical concept coined by political scientist Hannah Arendt in her 1963 bookEichmann in Jerusalem. In this book, she describes the trial of Nazi official Adolf Eichmann, an architect of the Holocaust who was on trial in Jerusalem for his crimes. Look at the picture above of Eichmann. Does he look live evil incarnate to you? Arendt was surprised by how normal and boring this evil Nazi figure turned out to be. This is when she coined the term “banality of evil” to refer to the fact that evil is not always perpetrated by psychopaths with obvious evil tendencies, but instead, evil is often the doing of normal, average people who give into an evil ideological power and do its bidding without question. Evil is often banal in appearance, dull, and average. Eichmann defended his actions by saying that he was simply following orders and that he had broken no laws because the murder of the Jews was authorized by Hitler in Nazi Germany. To relate this back to the story, let’s fast forward to the moment when Le Guin reveals that the entire happiness of Omelas depends upon the entrapment and misery of a child. The misery is revealed to everyone eventually as they get older, but they are not allowed to intervene. They go on knowing that this misery creates their happiness. This raises the question: Is this an ethical social and political system? Are those who witness the child’s misery and do nothing absolved by their claim that they are simply following orders as Eichmann had claimed? Hitler believed he was creating an Aryan utopia on the backs of the misery of ethnic minorities. Thus, would the German citizens who knew of the Holocaust but did nothing be excused by the “just following the laws” excuse? Think about how Le Guin may be depicting an unpleasant truth in our own society. For example, we know that many of the consumer goods we enjoy are manufactured overseas by child labor. Thus, like in Omelas, we know for a fact that there are children who are suffering for our material comfort. Does this make us responsible for their suffering? Are we hypocrites when we object to child abuse in America but then buy products made in sweat shops? But then again, is it possible for us to even buy anything in this day and age in full certainty that it wasn’t made under inhumane conditions? Finally, consider those who “walk away” from Omelas. Why do they make this decision? Are they morally absolved by leaving the city? What would you do in their circumstances? Would you walk away or would you stay, knowing that the vast majority of people are happy while a single soul suffers? 1. What does equality mean and what would an “equal” world look like? 2. Are natural talents and physical advantages unfair? 3. How do (or should we?) pursue fairness and equality without infringing on peoples’ individuality and rights? American writer noted for his wryly satirical novels who frequently used postmodern techniques as well as elements of fantasy and science fiction to highlight the horrors and ironies of 20th-century civilization. Much of Vonnegut’s work is marked by an essentially fatalistic worldview that nonetheless embraces modern humanist beliefs. In the early 1950s Vonnegut began publishing short stories. Many of them were concerned with technology and the future, which led some critics to classify Vonnegut as a science fiction writer, though he resisted the label. His first novel,Player Piano (1952), elaborates on those themes, visualizing a completely mechanized and automated society whose dehumanizing effects are unsuccessfully resisted by the scientists and workers in a New York factory town. For his second novel, The Sirens of Titan Vonnegut imagined a scenario in which the entire history of the human race is considered an accident attendant on an alien planet’s search for a spare part for a spaceship. While there is not one specific definition of humanism that all humanists adhere to, generally, humanists belief in the rights of individual liberty, freedom of expression, the need to ensure the rights of others and act ethically, and to make decisions based on reason and not supernatural beliefs. Given this in mind, how might “Harrison Bergeron” illustrate humanist beliefs? Think about how this dystopia set in 2081 may illustrate what Vonnegut believes the be the dangers of a society that fails to recognize humanist ethics. Government Regulation, Censorship, and the Media. As the Handicapper General, Diana Moon Glampers has a powerful role in controlling the behavior and thoughts of American citizens. She is able to burden their bodies with weights, distort their vision with glasses, and beam mind-paralyzing sounds into their brains to prevent critical thought. She is also able to control the public by controlling the media, televising a poorly performed ballet instead of more quality and informative programming. As you read the story, think about how Vonnegut depicts the government enforcing its rules about equality through regulation over human behavior and censorship of the media. Although Vonnegut’s story depicts a dystopian future, are there any ways in which you can find traces of this in our present society? What might Vonnegut be saying about government regulation of human liberties and the media? Is there a happy medium between enforcing fairness and allowing for individual liberties? “Tall Poppies” is the idea that the general population of average people becomes resentful of those who excel in certain activities and talents and want to see that person “cut down.” Some commentators think that our love of celebrity gossip and scandal comes from a tall poppies kind of thinking: that we enjoy seeing people above us fall from grace. In your opinion, does “Harrison Bergeron” exhibit this kind of thinking? Furthermore, the story also questions our attitudes toward ability and equality. Equality is a laudable goal, but how do we ensure equality in a world where everyone is different? Should we take away everyone’s individuality and uniqueness in order to ensure equality as illustrated in “Harrison Bergeron”? Does equality mean everyone receiving the same things, or is the process of ensuring equality more complicated than that? Would you endorse this form of equality or would you propose alternative paths toward creating an equal society? William Butler Yeats (1865-1939) was a widely popular Irish poet, Nobel Prize winner, and Senator in the Irish government. As a writer, his poetry evolved from strict verse and rhyme to a more experimental form. In “The Second Coming”, you can see the trace of a form, some repeated rhythm, form, and rhyme, but it is mostly haphazard and scattered. Perhaps, in writing in a disorganized scheme, the form of the poem reflects the chaos of the poem’s theme. Yeats maintained a fascination with spiritualism, religion, the occult, and astrology over his life and theses themes are often found in his work. “The Second Coming” refers to the second coming of Christ, which is prophesied in The Bible. As you read the poem, look for biblical allusions. How and when does he refer to The Bible and why? Butler believed in 2,000 year cycles that would bring about a change in the world. In 1921, he saw that it was almost 2,000 years since the birth of Christ and that the events happening in the world around him gave evidence to his belief that some kind of profound change would sweep the world. Yeats wrote right after the end of WWI and the Russian Revolution, both times of chaos, anarchy, and unfathomable violence and bloodshed. Thus, the world around him reflected the kind of chaos depicted in this poem. We can read it as a political commentary. For example, what does he argue when he writes “The best lack all conviction, while the worst/ Are full of passionate intensity” ? What is his opinion on the state of affairs in human civilization in 1921 if this is how he describes the world around him? As you analyze the poem, consider how it fits into the theme of the dystopia. In what ways does the world and society he describes resemble the kinds of dystopias depicted by the short stories we have read? What is he saying about the modern world in the 20th century if it resembles an apocalyptic dystopia?